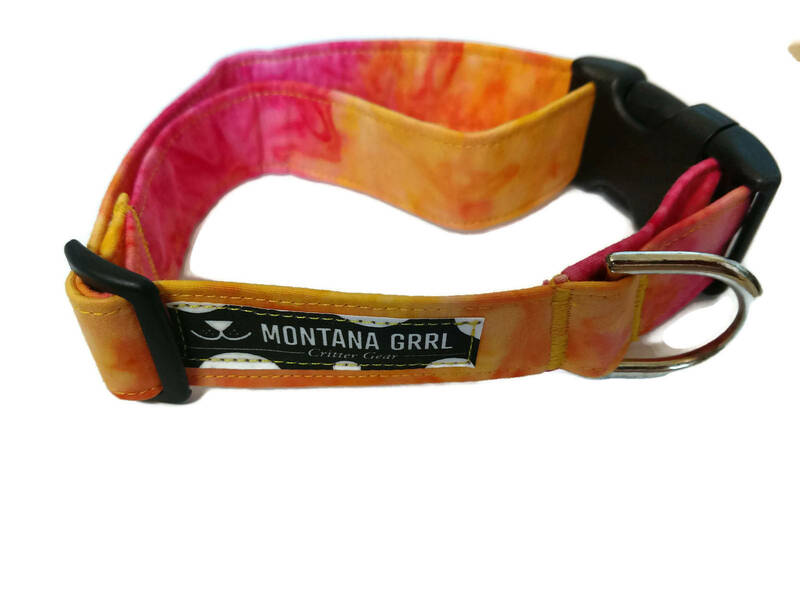 The colors of a Big Sky Sunset just for your pup! Each collar is constructed using top quality hardware, sturdy (not stiff) interfacing and cotton fabrics. The curved side release buckles are used to hug, not irritate, your dogs neck. The collar has a heavy duty D ring. This collar doesn't contain nylon webbing. Beautiful, vivid colors, excellent craftsmanship, I could not be happier with my purchase...for our new Golden puppy. We live in Montana, the "Big Sky sunset" colors are splendid. I will be back, and highly recommend Montana Grrl's Critter Gear!